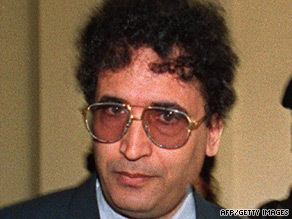 A Scottish court has formally allowed Abdelbaset Ali Mohmed al Megrahi to abandon his second appeal against his conviction over the 1988 Lockerbie bombing, in which 270 people were killed when an airliner was blown out of the sky. Last week, al Megrahi lodged a “minute of abandonment” with the Scottish Court Service, which is a legal move to drop an appeal. The Scottish Court of Appeal in Edinburgh confirmed Tuesday it had accepted the request. Analysts say the move may be part of a deal al Megrahi is seeking with Scottish authorities to be released on compassionate grounds. A compassionate release could allow al Megrahi, who has maintained his innocence, to return to his native Libya. Megrahi, 57, who is suffering from terminal prostate cancer, is currently serving a life sentence for the bombing of Pan Am flight 103 in 1988 which killed 189 U.S. citizens and 270 people in total. The court announcement follows increasing pressure from the U.S. for Al Megrahi to remain imprisoned in Scotland. On Monday, seven U.S. senators wrote to the Scottish government urging that al Megrahi be kept in prison indefinitely. The letter continues: “Our international agreement called for his sentence to be served in Scotland and we believe strongly there should be no deviation from this sentence.” The senators’ letter follows opposition to Megrahi’s release from victims’ families in the U.S. and U.S. Secretary of State Hilary Clinton last week.